In a medieval Venice ravaged by famine and orgiastic revelries, the protagonists of The Apothecary’s Shop explore the depths of the city and the paths to the supernatural in their search for a missing child. The young Costanza, of the noble Grimani family, has disappeared. Edgardo, the family scribe, vows to return the girl to her family, an ambitious enterprise considering his failing eyesight. Physical ailments and emotional torment hinder Edgardo’s search, for as he undertakes this perilous investigation, images of his own lost love—Kallis, a slave from the Far East who disappeared in a storm years ago—are resurrected. Help arrives in the form of Abella, the only female doctor in Venice. From her, Edgardo learns of occult medical practices and of Sabbatai’s Apothecary, where the city’s most desperate citizens seek heretical remedies and concoctions to sooth their suffering. It is here, however, where the secret of Constanza’s disappearance may lie. Venal physicians and legitimate healers, unscrupulous relatives, mystics and apothecaries, wealthy nobility and the wretched poor, undertakers, Eastern merchants, African slave traders, each plays a role this ingeniously constructed mystery set in the busy and licentious trade port of Venice. The Apothecary’s Shop is an erudite literary thriller in the vein of Umberto Eco’s The Name of the Rose and takes readers on an astonishing voyage into a city both distant yet familiar. Roberto Tiraboschi was born in Bergamo, Italy. He is known as one of Italy's most stylish screenwriters and playwrights. His novels have enjoyed success with both critics and readers. The Eye Stone was the first of his novels to be published in English. Katherine Gregor translates from Italian, Russian and French. For Europa Editions, she has translated Eva Sleeps by Francesca Melandri and The Eye Stone by Roberto Tiraboschi. She is also a playwright and a fiction writer and maintains a regular blog at scribedoll.wordpress.com. 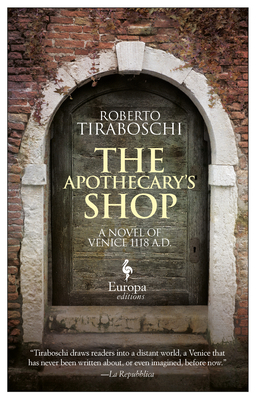 "Nobody writes about Venice like Roberto Tiraboschi in The Apothecary's Shop." "The pieces of this mystery allow Tiraboschi to pull us into a distant world, a medieval Venice that we are not used to imagining and that has rarely been written about." "An extraordinary book, a gripping trip back through time to discover a different but still unique Venice and its political intrigues and mysteries, where the scents of spices and opium, drugs and poisons, love and suffering, and East and West are just some of the ingredients of a story that is impossible to forget." "This exceptional vision of a city in the throes of metamorphosis will persist in the reader's mind long after the murder mystery is resolved...A noir situated in beautifully evoked 12-century Venice." "Roberto Tiraboschi knows how to recount a city and an era that are both poisoned by intrigue and violence. His writing is powerful and evocative."